If your child is in need of emergency dental care, please call our office immediately. Our practice reserves time in our schedule specifically for seeing emergency patients. We do everything we can to see you as soon as possible! If for some reason there is no answer when you call, we advise that you go to your nearest emergency room. Oftentimes, timeliness is crucial to saving a tooth! Some good rules of thumb your child can follow to avoid dental emergencies are to wear a mouthguard during sports, use scissors not their teeth to cut things, and avoid chewing ice, popcorn kernels, or hard candy. We schedule extra time in our day to accommodate same-day emergency care. So, if you find yourself in need of a dentist fast, call us immediately! We have experience in providing comprehensive care to children of all ages, no matter what the situation entails. We'll take care of your child quickly and gently, allowing them to go on with their day pain-free. Does your child have a dental emergency, and you’re wondering what to do? We’ve compiled a first aid guide to help you act quickly whenever an injury occurs so that you can protect your kid’s teeth and gums and prevent serious damage. Have your child bite down on clean, folded gauze or cloth over the bleeding area for 15 minutes. Repeat once more if necessary, but call us if the bleeding continues. Apply wrapped ice to the bruised areas. If there is bleeding, apply gentle pressure with clean gauze or cloth. If the bleeding does not stop after 10 to 15 minutes or it cannot be controlled by pressure, go to your nearest emergency room or urgent care center. Carefully pick up the knocked-out tooth, making sure to touch only the crown (top). Rinse the tooth if needed, but do not clean or handle it unnecessarily. If the tooth is not broken or cracked, gently reinsert it in its socket. Please don’t force it into the socket! 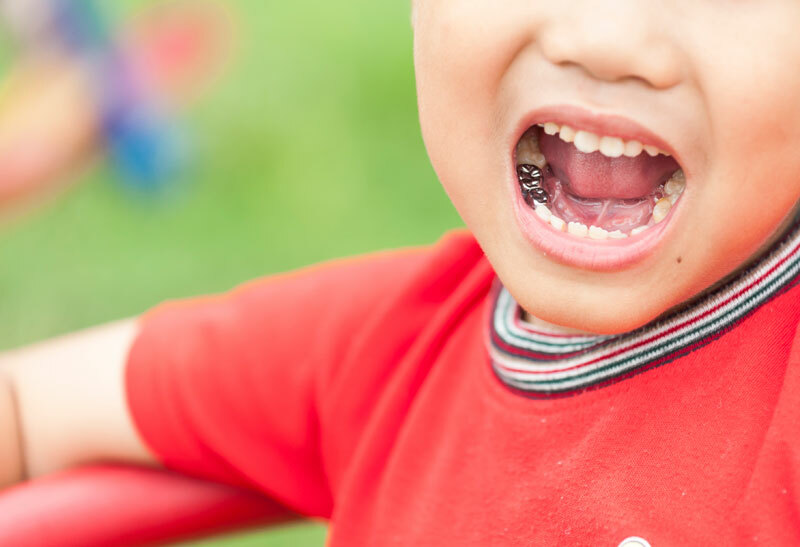 Hold the tooth in place by getting your child to bite down on clean gauze or cloth. If you cannot reinsert the tooth, visit us immediately. While transporting the tooth to our office, place it in a cup of milk to keep the root alive until you see us. Clean around the sore area with by rinsing with warm salt water. Try to dislodge any trapped food or debris with dental floss. Give your child an over-the-counter pain reliever to help ease the pain until you can see us, but do not apply aspirin directly to the aching tooth or gum tissue as it can increase the pain. If the area is swollen, apply a cold compress or a bag of frozen peas for 15 minutes. Over-the-counter medications usually provide relief, but if sores are large or severe, we can provide treatments to ease the pain and speed the healing process. Use floss to try and gently remove the object. Never use a pin or sharp object to try and dislodge the stuck object as you make do further damage to the tooth or gums. If you can’t get the object out, visit our office.